NEW YORK (CNNfn) - Dow Chemical Co. agreed Wednesday to buy Union Carbide for about $11.6 billion in stock and debt, shoring up Dow's standing as one of the world's biggest chemical companies. The deal marks the rapid consolidation underway involving chemical firms and vaults the combined company ahead of Germany's BASF to second place in the global chemicals business, after DuPont, according to one industry measure. Dow (DOW), which also trails industry leader DuPont (DD) in the U.S market, makes chemicals, plastics, herbicides and well-known consumer products such as Styrofoam insulation. It also was a one-time partner with Corning Inc. in an ill-fated silicone breast implants venture that has resulted in years of litigation. Union Carbide (UK) is the fifth-largest U.S. chemical firm, producing specialty chemicals, polymers and solvents for the paint and coatings industry and is a major maker of plastics used in a range of products including soda bottles and garbage bags. The deal, which is subject to regulatory approval, would give Dow shareholders 75 percent control of the new company, while shareholders in Union Carbide would hold the remaining 25 percent. The combined firm will be known as Dow Chemical and have headquarters in Dow's hometown of Midland, Mich. The companies plan to slash about 2,000 jobs as part of their cost cutting efforts. "We see the industry in a consolidating mode," William Joyce, CEO of Danbury, Conn.-based Union Carbide, told reporters in a conference call. He said the company had been looking for the "ideal partner." Union Carbide has been struggling with pricing pressures and trying with little success to boost its performance by cutting jobs and costs. Shares of Union Carbide, a component of the Dow industrial average, soared on news of the deal, gaining 10-9/16 to 59-3/8. But investors in Dow Chemical were not as thrilled with the deal. Dow shares slipped 6-1/16 to 118-5/8. The deal, which includes $9.3 billion in stock and $2.3 billion in debt, values Union Carbide shares at $66.96 apiece, based on Tuesday's closing price of 124-11/16 for Dow Chemical's stock. That's a 37 percent premium over Union Carbide's closing price Tuesday. The deal links two companies with controversial pasts. In 1984, a gas leak from a pesticide plant run by Union Carbide India Ltd. in Bhopal killed about 4,000 people and injured thousands more. Dow has been embroiled in lawsuits over its venture to produce silicone gel breast implants. Dow Corning Inc. last year agreed to a $3.2 billion settlement with women who charged that the implants have caused health problems. The company also was one of several chemicals companies involved in the production of the defoliant known as Agent Orange, which was used in the jungles during the Vietnam War and later linked to cancer and birth defects. Wednesday's deal comes as something of a surprise, said analyst Fred Siemer of F.H. Siemer & Co. While Union Carbide had been searching for a merger partner, he said rumor had it that a non-U.S. company would be the buyer. "I didn't think too many people thought it would be Dow Chemical," he said. He said Dow's falling stock price may reflect concerns on Wall Street that the combined company will be more cyclical, meaning its performance will be more closely tied to general economic conditions. He said Dow will increase its exposure to polyethylene, a plastic used in many consumer products that is one of Union Carbide's core products. 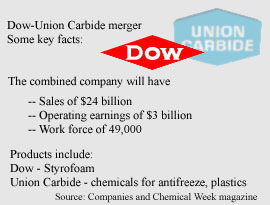 But another analyst, Tom Burnett of Merger Insight, said Dow Chemical was well poised to scoop up Union Carbide. Dow recently reported a second-quarter profit that was 4 percent lower than last year's but still exceeded expectations. Dow's stock price also has been rising steadily. "This is not a transaction of equals -- this is tough, dominant Dow," Burnett said. "They're in charge." Under the terms of the deal, Union Carbide shareholders will receive 0.537 share of Dow Chemical stock for each Union Carbide share. The deal should boost Dow's earnings per share in the first year after the deal closes, the companies said. The new company will have combined annual revenue of about $24 billion and operating income of $3 billion. Dow CEO William Stavropoulos said the deal will link two companies with "similar cultures and a complementary fit." "This transaction is a giant step in our strategy to transform Dow into the world's most productive, best 'value-growth' company in the chemical industry," he said, adding that more acquisitions may be on the horizon. But the companies' similarities could be problematic from a regulatory standpoint. "I think investors need to be careful because there are some significant antitrust overlaps" in the chemical companies' businesses, Burnett said. "The antitrust review in the U.S. and Europe will be extremely detailed and we do not expect the transaction to close before February." The companies may be forced to divest significant assets to satisfy regulators, he said. "There might be 10 products where there are concerns," he said. But the companies played down any potential problems. "We don't anticipate anything that we can't handle here," Stavropoulos said. Pending shareholder and regulatory approval, the companies said they hope to close the deal in early 2000. The deal will create the second largest chemical company in the world, according to Chemical Week magazine. The magazine currently ranks Dow third in terms of chemical-only revenue, with sales of $19.05 billion, after DuPont, which recorded sales of $24.1 billion, and BASF of Germany, with $20 billion. Union Carbide ranked 21st with sales of $6.5 billion. According to Fortune magazine, Dow is the fifth-largest chemicals maker in terms of revenue, after DuPont, Bayer, BASF and Hoechst. Dow has been on an acquisition streak. Earlier this week, the company announced it would buy Angus Chemicals Co., a specialty chemicals maker based in Buffalo Grove, Ill. Terms of the deal weren't disclosed. Dow and Union Carbide officials said they expect to achieve annual cost savings of at least $500 million through the merger. They will cut about 4 percent of their combined work force, or about 2,000 jobs, for a total headcount of about 49,000. They said they will try to lessen the effect of job cuts through reduced hiring, attrition and other measures but didn't have any details about where the cuts would occur. The companies said they don't anticipate closing any plants and that some operations may be run out of Union Carbide's current headquarters in Danbury. Union Carbide stock price over the past year. The deal has been approved by the boards of both companies and it should be accounted for as a pooling of interests. Dow will issue about 3.8 million shares of stock to qualify for pooling under U.S. tax laws. Joyce, Union Carbide's chairman and CEO, will join the Dow board as vice chairman. One other member of the Union Carbide board will join the Dow board. The merger negotiations began in earnest about a month ago and intensified over the past 5 or 6 days, Joyce and Stavropoulos said. The two CEOs noted that they have known one another for about 20 years. One issue that must be resolved is Union Carbide's 71-year membership on the elite Dow Jones industrials index once the company is folded into Dow Chemical. A Dow Jones spokesperson said Wednesday that the managing editor of the Wall Street Journal and other board members will review the merger to see if the new company qualifies for the 30-stock index, but previous mergers involving Dow stocks generally have resulted in those companies being removed from the blue-chip group. Union Carbide joined the index Oct. 1, 1928, when the market gauge was increased to 30 stocks from 20. The most recent change to the list was made in March 1997, when four stocks were replaced by four others.